The MAGION-2 subsatellite of ACTIVE mission, launched on November 1989, worked between December 21st, 1989 and November 29, 1990. The Romanian triaxial magnetometer SG-R7, initially used only as a navigation instrument, has also provided scientific data, i.e. in-situ observations of the geomagnetic field. 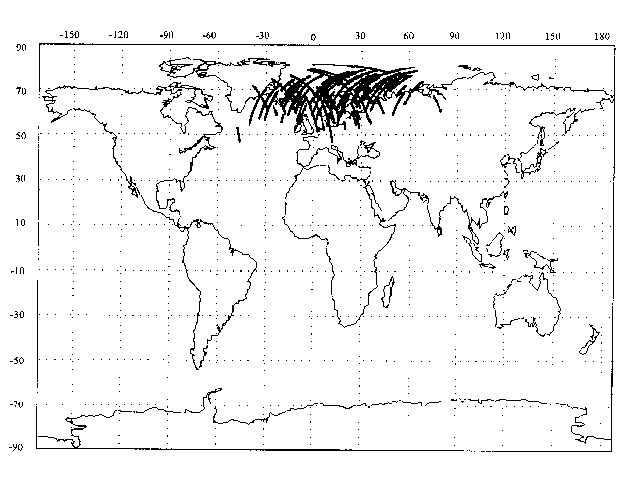 During the 12 months on orbit the magnetometer detected "events", which are transversal geomagnetic disturbances. They were usually asigned to a system of field-aligned currents, predicted at the beginning of this century by K. Birkeland, strongly supported by Hannes Alfven, and eventually discovered by means of in-situ satellite measurements by Zmuda and Anderson in the 70ties. These electric currents flow in ample current sheets and are an important factor of the coupling and energy transfer into the solar wind - magnetosphere - ionosphere system. Following the investigation of more than 600 telemetric records, more than 80 geomagnetic events were identified in the interval January-November 1990, located in the auroral oval region of the Northern hemisphere, in the radio receiving area of the Panska Ves Observatory (Czech Republic). These events were stored on the Catalog of Auroral geomagnetic Events, a STEP documents edited by the Institute for Space Sciences - Bucharest in 1993. The figure bellow, displays a sample page of the Catalog. The first three plots of each Catalog page show the components of the magnetic field after the subtraction of the low amplitude smooth trend. In the fourth panel is displayed the magnetic field variation measured by the SG-R6 monoaxial variometer. The fifth panel shows the time evolution of the pitch angles of the satellites axis. Finally in the sixth plot we present the spectral analysis of the magnetic variation. A FFT window is moved contiguously and the resulting spectra are shown. At the bottom of the Catalog page one can find various geophysical parameters like: UT - Universal Time; LON - geographic longitude; LAT - geographic latitude; ALT - the altitude of the satellite; L - Mc'Ilwain's parameter; B - local magnetic induction; MLON - geomagnetic longitude; MLAT - geomagnetic latitude; LINV - invariant latitude.